I popped along to the BP Portrait Award with a friend - a perfectly sized exhibition for a Friday evening! It's been a while since I visited a painting exhibition so it was interesting to see what's going on in the world. 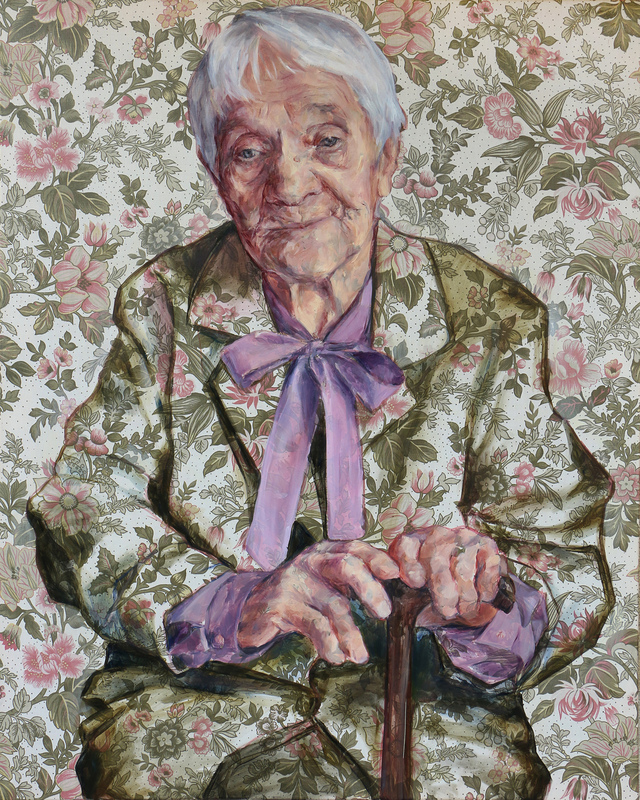 This is Mrs Anna Wojcik by Monika Polak, and I was baffled by it for a long time, trying to understand her thoughts in painting the flowers on the clothes 'flat' in a painting that was otherwise so realistic and 3-dimensional; also why she chose to echo the fabric of the jacket in the background ... until I finally realised the whole painting was on floral fabric. A bit slow on the uptake sometimes! But it turns out Monika Polak has worked on a whole series like this and I think they are magical. The Oolographer by J.J.Delvine was also a great conversation starter - from trying to understand how we'd go about creating a self portrait from the side (do serious artists ever work from photos? They have me believe not but ...), to piecing together the choices made in selecting each picture around his studio. And the questions continue - I couldn't figure out how 'real' this picture was, and how much it was a 'facade' - is Delvine actually into studying bird eggs (apparently Oology is a thing! ), or is he playing with us? Where does the play start and stop? As Nicole and I discussed the first painting (by Jesus Maria Saez de Vicuna Ochoa), we found ourselves drawn into conversation with a man who (understandably) simply couldn't believe the picture was not a photograph. Since I am currently reading The Participatory Museum by Nina Simon, I was amused to find myself a visitor, fulfilling one of the deeper levels of engagement that she describes! I frequently find myself mulling what our key aims are as museums and galleries, and also within a learning team. Something has changed in my (and I think the sector's) mindset over the last twelve years - a kind of evolution from the primary focus being the requirement to learn something, towards (at last!) allowing for a more open-ended possibility. The idea that a gallery or museum can simply be a space, and that each visitor might respond to it and use it for different purposes. But the greatest achievement of all is perhaps the moment when people who came to use the space for one purpose (perhaps a picnic, a place for the kids to run around, a place to sit down), find themselves connecting with someone else through an exhibit ... and perhaps discovering something something new about themselves, their tastes, their interests.